Mirrors are distinct. Even though mirrors at first glance may seem identical, they are still physical artifacts and thus not entirely identical. Differences in mounting, framing, or even inconsistencies in the glass or reflecting surface make each mirror in existence an individual entity. Mirror mages learn to study a mirror, taking note of these inconsistencies, until they can identify a specific mirror even in a room full of imitators. Mirrors are conditional. Mirrors are characterized by what they reflect as much as what they are. This is seen, in part, in the scenes that play out in the shards of mirrors found in Rebma. A mirror that is too far removed from a known environment can be rendered useless to mirror magic. Mirrors are correspondent. If the first two qualities of mirrors are considered, it follows that two mirrors can be made more or less identical by altering their physical nature or by altering the scene reflected within. Mirror mages who specialize in communication tend to craft their mirrors to be as identical as possible to aid in achieving contact, and many higher level mages build scyring rooms that imitate those used in initiation, to further increase the correspondence when contacting or travelling between their peers. Development in mirror magic is marked by three formal mystical Initiations. There are some who consider there to be a minor initiation marking the graduation of an Apprentice to a Journeyman, but there has been sufficient evidence of students clearing this hurdle through private study alone, which damages the arguments in favor somewhat. The First Initiation is the initiation that leads the prospective student to an understanding of the distinct, conditional, and correspondent nature of mirrors. It is prefaced by intense study, and culminates in a day-long meditation within a reflecting room, lined entirely with mirrors to reflect the apprentice into infinity and back. Should the apprentice complete the requisite meditation, and contemplate the contained infinity for a full day and night without succumbing to madness, the insights gained are the first step on the path of the mirror mage. Those whose minds do not manage the initiation intact are not allowed to survive, as they often manifest strange and dangerous powers afterwards. The Second Initiation is the preparatory step to becoming a Master mage. This initiation is controlled by the ruling cabal, and permission to undergo it is strictly limited to mages who are sympathetic to the cabal's aims. Masters who go rogue and offer an alternative course to initiation are firmly, often terminally, discouraged. The initiation itself is not spoken of often, but whispers that have emerged point to a variation of the First Initiation. Instead of merely contemplating infinite reflection, the prospective Master must bring themselves to stand within and between the reflections, applying their knowledge of mirror transit to hold themselves in a halfway state from sundown to sunup. The risk of this initiation is not mental - instead, should concentration waver or exhaustion take its toll, the applicant can be physically sundered into thousands of pieces. The Third Initiation is administered to Master mages upon their ascension to Grandmaster status, and also marks their membership in the inner cabal. It may possibly be mythical; no information about it is available except to those who are permitted to undergo it. In addition to its use in initiations, a psychomanteum, or reflecting room, is often constructed as a place of personal power for a mirror mage. Surrounded by mirrors, distractions are removed and the mind is focused on the task at hand. In addition, the empty reflective nature of the room makes it difficult to find those small details that allow a rival to identify and memorize the mirrors in the room for later use. While an expert may need only a few minutes of study to learn a mirror under normal conditions, memorizing a mirror within a psychomanteum may take hours or even days of concentration. Still, a room such as this is not a thing built lightly, for while it has advantages they are not without cost. Remember that these are the same rooms as used in the ordeals of initiation - it is no small thing to be surrounded by and confronted with one's self made infinite. Only mages with a firm and honest sense of their self are likely to spend much time in such a situation. Those of lesser will, or who harbor illusions about their true natures and wish to preserve them, would be better served by confining themselves to single, simple mirrors. UP-Mystical is the general lore for mystic characters. It provides the prerequisites for a number of gifts, as well as a channel of gossip for other mystics in the game. GL-Rebma is Rebma's location lore. In addition to providing access to Rebma gossip and details about the setting, it is also a prerequisite for more advanced gifts. GP-Mirrors is really the key lore to measure one's standing as a mirror mage. While studious application and self-study will allow a character to achieve up to level 5 in GP-Mirrors, to move beyond this requires a trainer, and thus requires the character to undergo the Second Initiation. 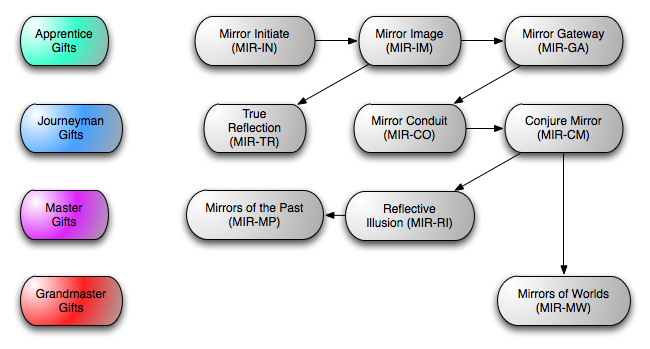 The basic gift for Mirror Magic is Mirror Initiate (MIR-IN), which gives the character access to all other commonly available mirror gifts. Mirror Message (MIR-ME) is an exception, as it has no gift requirements and is tended to allow non-initiates a means of contacting initiates they are familiar with. There is no need to take MIR-ME if you intend to pursue Mirror Magic. Apprentice Gifts are the fundamental abilities of the mirror mage - communication and transport. These abilities are relatively commonplace in Rebma - tutors are easy to find, and many Rebmans of a mystical bent will often dabble in mirror magic by learning these skills. Journeyman Gifts represent a commitment to the pursuit of mirror magic; they begin to have Lore requirements as well as prerequisite gifts, and require more intense instruction from Master mages. At this point, a mirror mage is expected to spend at least part of their time serving the larger community of mages as part of the price of training. Master Gifts have Lore requirements greater than 5, and as such are only available to mirror mages who have undergone the Second Initiation. These are potent abilities, and the gifts listed here are only ones commonly known to the public. Many Master mages have developed their own abilities not seen here. Grandmaster Gifts are the province of the most powerful mirror mages in Rebma. Potent enough to defy all belief, their Lore requirements are almost impossibly high. In order for a mirror to be useful for contact, you must be able to see your entire face in it. This means it must be either large, or held close to the face. In practice, this means a mirror about the size of a makeup compact is the effective minimum size for a mirror. In order to use a mirror with MIR-GA, it must be large enough to physically walk through. When contacting a mirror, the recipient is not in any way notified of the call. Unfortunately, mirrors have neither ring tones nor vibrate mode. The only way the recipient knows you are calling is if they are already looking at the mirror. It is recommended that scheduled contact times are made, or that when at leisure one keeps one's mirror open and to hand. As a corrolary to the above, it requires an act of will on the part of the recipient, ICly, to begin a MIR-IM conversation. This means that you cannot contact a target mirror and yell really loudly to get their attention.